After two weeks of brutal record breaking heatwaves simultaneously in parts of the US, Europe and the UK, NOAA have released their latest report of worldwide climate for May and the first 5 months of 2017 and it’s no surprise May was the third warmest on record and 2017 so far is the second warmest on record! Consistent with 2016 global trends that continued into the first five months of this year, much of the world’s land and ocean surfaces registered persistently warm temperatures for both May and the year to date*. Let’s dive deeper into our monthly analysis. The average global temperature set in May 2017 was 1.49 degrees F above the 20th-century average of 58.6 degrees, according to scientists from NOAA’s National Centers for Environmental Information. This average temperature was the third highest for May in the 1880-2017 record, behind May 2015 (second) and a record-breaking May 2016. The average temperature from March through May was 1.66 degrees F above the 20th-century average of 56.7 degrees. This was the second warmest for this period, trailing the 2016 record. The year-to-date average temperature was 1.66 degrees F above the 20th-century average of 55.5 degrees. This was the second-warmest for this period, behind the record set in 2016. The average Arctic sea ice extent for May was 5.3 percent below the 1981-2010 average, the fifth smallest for the month since satellite records began in 1979. The average Antarctic sea ice extent was 10.6 percent below average, the second smallest on record for May behind 1980. The Northern Hemisphere snow cover extent was 9 percent above average, the 12th largest in the 51-year record. North America had its 18th largest snow cover, while Eurasia had its 12th largest. The globally averaged land-surface temperature (seventh warmest for the month of May) and the sea-surface temperature (third warmest) ranked second highest on record for the March-to-May season and the year to date. 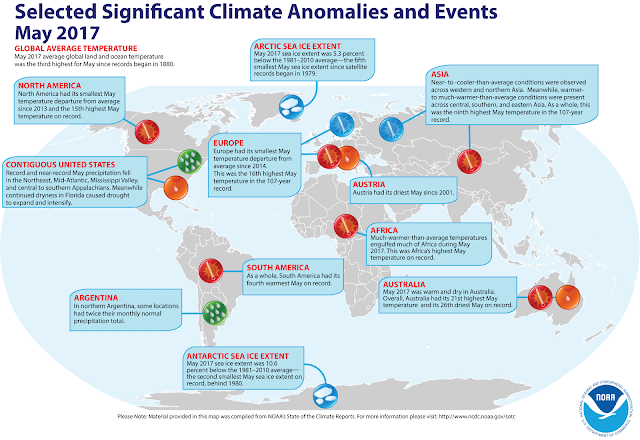 Africa had its warmest May on record; South America, its fourth; Asia, it’s ninth; North America, its 15th; Europe, its 16th (tied with 2014); and Oceania, its 20th.